On September 10, 2006, Philip Harper, then chief sake brewer at Daimon Shuzō (aka Sakahan) in Katano, east Osaka, explained the intricacies of sake brewing and talked about his new book, The Book of Sake (Kodansha International, 2006) to SWET Kansai members. Color photos of the brewery tour are posted on the SWET website. “Editorial Insights” from the editor of the book, Barry Lancet, follow the article. Literature major Philip Harper, after three years in Japan, decided he wanted to learn how to brew sake. He entered the employ of a small brewery in 1991. With still minimal Japanese and with little in-depth information about sake in English, he borrowed scientific papers on sake brewing and his journey to becoming a master sake brewer, tōji (杜氏), began. 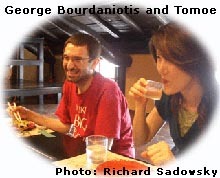 To make different brands of sake more accessible to more non-Japanese speaking people, he released his first book on sake, The Insider’s Guide to Sake (Kodansha International), in 1998. This was a compact carry-along book containing reviews of 120 brands of sake. But Harper also wanted to publish a book with glossy pictures and more detailed information about the sake brewing process. This wish was realized as The Book of Sake, released in August 2006. It was a quiet Sunday when Harper first took a group of eleven SWET members and friends for a short tour around the Sakahan brewery where he is “sometimes the only one present to check on fermenting batches of yeast in the middle of the night.” Since the tour took place in September and brewing does not start until October, most of the equipment was still in storage, but Harper kindly showed us the premises, from the shiny vats to the blower (“imagine it hanging up there on the ceiling humming away”), and explained in detail about the brewing process. Much of the process is now automated, making it less strenuous and labor intensive, but it is still quite time consuming. At small breweries like his, in order to produce higher grades of sake and a differentiated brew, traditional methods are making a comeback. Thirty years ago, there were approximately 3,000 sake breweries in Japan. When Harper first started working in the industry fifteen years ago, the figure had dwindled to about 2,000. Today there are only 1,000 to 1,500 breweries. Sake brewing traditionally drew its labor force from rice farmers, so it was a source of winter work. Most of the people Harper worked with when he first started were from the Tajima area in northern Hyogo prefecture. They would come to the brewery after the rice harvest finished, and would work, eat, and live there until the brewing was finished in the spring. Traditionally they worked every day without a break, because everyone wanted to return home as soon as they could. Now, however, the only person on site every day during the brewing season is Harper himself. Everyone else has Sunday off. “Unlike in winemaking, where grape varieties dictate the characteristic qualities of a wine, rice variety is not a major variable in the flavor of the final product in sake.” Rather, it is the quality of the water (70-80 percent), the rice (10 percent), and the sake mold (kōji 糀 ) variety, the latter in fact having a more direct influence on the sake than the rice variety. Of all the rice used in brewing, approximately 22 percent is made into (kōji mold culture. The rest is used as kakemai (掛米 )-steamed rice that goes straight into the fermenting sake. A different polish of rice is used for kōji and kakemai. 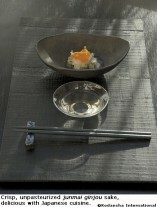 The degree of polishing defines the grade of sake—junmai (純米 ), ginjō (吟醸 ) and daiginjō (大吟醸 ). The sake-making process begins with rice and water. For some kinds of sake, brewer’s alcohol—basically shōchū (distilled spirit)—is added to balance the flavor, and until recently, sugars could also be legally added for very low ranks of sake. Cheap supermarket sake may contain enough alcohol to triple the amount of sake in the bottle, but it is not interesting in the way higher grades of sake are. Some alcohol may sometimes be added to some high-quality grades of sake, like ginjô and daiginjō, not to make the sake cheaper, but to give the sake a crisper feel and aroma. When brewing ginjō sake, the tōji will often aim for a very fruity, flowery kind of sake. The positive reason for adding alcohol is that aromatic substances dissolve well in alcohol, but they do not dissolve in water. The substances that form the smell are in the air and could easily disperse at the brewing stage, so alcohol is added just before pressing to trap in some of the nice smells that are preferred in higher grades of sake. The Japanese for this process, arukoru tenka (アルコール添加 ), smacks of “additives” and may evoke a bad image, but the reasons for adding alcohol are good, as well as economic. In writing The Book of Sake, Harper wanted to strike a balance between explaining these complex influences on the flavor of sake and making the story interesting. These are some of the arguments that he worked hard to present in easy-to-understand language. Harper went on to explain how the two types of water, soft and hard, affect sake making. Soft water has lower mineral content and tends to produce sweeter sake. Usually, the harder the water, the dryer the sake. The water used at Sakahan, taken from the neighboring mountain, is very soft. Nihonshū do (日本酒度 ), the sake meter level, is a gauge sometimes seen on bottles and menus as a plus or minus figure, is basically the specific gravity. Plus is for dry sake and minus is for sweet sake. Zero is supposed to be neutral, although it tastes a bit sweet to most people. The higher the figure, the sweeter or dryer the sake. A sake around the +5 or +6 level is quite dry. A sake around -1 or -2 clearly tastes sweet to most people. A sake of -5 is extremely sweet by today’s standards. However, Harper also explained that it is best to take these figures with a pinch of salt, because Nihonshū do is about the things dissolved in the liquid, which is not all sugar. For example, the most famous place in Japan for very dry sake is Nada (Kobe) where the water is by far the hardest of any used in brewing in Japan. When Harper was at one Nada brewery in the spring, he tasted a +5 sake that was “bone dry,” even a +5 sake from his own brewery is not that dry. 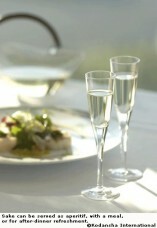 That is partly due to acidity and amino acids, and partly, again, due to the way the water works on the palate. When making sake with soft water, the tendency is to get a very gentle, soft-feeling sake, and it is hard to make a sake that people who prefer very dry sake will enjoy drinking; no matter how hard the tōji tries. Some regions or prefectures are famous for their water, but such a large region means necessarily that various sources of water will be used and the water will not have the same characteristics from place to place. Fushimi (Kyoto) and Nada developed as sake brewing centers for many reasons, but the most important is they both have great water sources. All breweries have their own water source that gives a specific character to their sake. This importance of water in sake brewing is not found at all in wine brewing where grape variety and local climate are the crucial factors in the flavor of the wine. Matsuzaki chose fifty varieties of sake to introduce in The Book of Sake and wrote the reviews. Harper did the translations. The original plan, when Harper started working seriously on the book in 2003, was not to introduce specific sakes at all. He had already done that for The Insider’s Guide. He had tasted and written up “a couple of hundred,” of which about 120 were included in the final text. But about halfway through the writing of the new book, after writing about the kind of flavors to expect from sake and the characteristics of each, it seemed to Harper to be a good idea to have specific sakes introduced as examples of different styles. That is when he enlisted Matsuzaki for a part that ended up as about 20 percent of the book. Matsuzaki is author of several books on sake in Japanese in which he has covered sake breweries prefecture by prefecture and explained the features of different brewing styles, the types of rice used, and the yeast varieties developed. 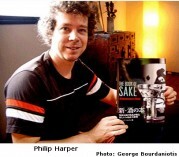 The third chapter in The Book of Sake explains the different regions from the north of Japan to the south, which Harper believes has not been done in English before. However, this book did not have enough space to include mention of all the 1500 breweries in Japan today. Despite the concern that people from the excluded breweries might complain about being left out, it could not be helped. Part of the decision to have Matsuzaki write the reviews for the book was to get around this problem. As Harper brews sake for a living, it would have been awkward for him to be seen making critical judgments of other people’s sake. Most of the photographs in The Book of Sake are new. Kodansha International sent a photographer to various breweries for the project. Breweries are often not keen to let people in to take photographs, but the breweries featured in the book were very welcoming. “I think it worked well,” Harper said. “The photographer was very tactful in the way he moved, and didn’t get in their way, so they got all these great pictures. I met the people who own the breweries where the photographs were taken. They were really pleased. Again, there haven’t been all that many pictures of the actual process of brewing in English books up until now, so it’s good.” Harper had a list of photographs that he wanted in the book and he was pleased with what was covered, though there were one or two he thought it would have been better to leave out. Very little happened on the book without Harper’s knowledge. He felt fortunate to work with experienced editor Barry Lancet (see “Editorial Insights”), who kept up a continuous conversation and gave him a fair amount of control over chapter content and organization of the book. In the manuscript Harper created a list of sake buzzwords with the idea of sprinkling them through the book. The editor, here, decided what to put where. Before the book finally went to print, Harper and his editor did an organizational shuffle of the book, where they moved a large section from the front to the back, and did a lot of rewriting. The whole process took three years. But once the brewing season begins, Harper’s focus shifts. He says, “the problem for them was that once I start brewing it’s very difficult to get any sense out of me.” This, he figures, caused a lot of grief for his editor, who needed him to check text. The color photos of Japanese cuisine in Harper’s book reminded some of the group that it was lunchtime; stomachs were rumbling. Sakahan also has a restaurant on the second floor of theentrance where they serve a full course of seasonal Japanese cuisine for a very reasonable price. After listening to Harper’s explanation of the sake brewing process, the group was eager to put to the test their new-found knowledge by ordering two different varieties of the Mukune brand. Both complemented the food excellently and as Harper explained to us, both were nicely rounded and slightly sweet on the palate, as one would expect when using soft water in the brewing process. An afternoon rainstorm broke as we finished our course, adding to the feeling of contentment and inclination to lounge in and enjoy the rustic surroundings before going out into the rain and back to the city. Copyrighted photos fromThe Book of Sake reproduced with permission from Kodansha International. Cover photo of The Book of Sake courtesy of Barry Lancet.